Lenovo H50-50 Sharkbay, Intel® Core i7 4790 Haswell CPU @ 3.60 GH, 2047MB NVIDIA GeForce GT 720, 8.00GB Single-Channel DDR3 @ 798MHz, Windows 10 Pro 64-bit, Antergos 64-bit, 2GB WDC (SATA), 3GB TOSHIBA (SATA). For anyone struggling with the same problem, just so they don’t have to trawl through the thread over at bbs.archlinux.org, and potentially waste time implementing the fixes which don’t work, here’s what I did. You might also want to add the packages to pacman’s ignorePkg list. For the record, as I was farting about with this workaround, they released lib32-qt4-4.8.7-6 which core dumps Skype completely. Any idea what needs to be installed to fix it? It was working fine, but an update seems to have broken it. @dastagg Cheers, buddy, I appreciate the effort. @dastagg Yeah, the odd thing is that Mate is set as default in .dmrc, yet when I get to the log-in screen, the default entry still shows as XFCE. It’s not a terrible chore to change–it’s just a case of choosing Mate from the drop down–but it’s an extra step that (a) wasn’t a problem a week ago, and (b) I often forget to do it, meaning I have to log out and then back in again. I have a few Desktop Environments installed: XFCE, Mate, KDE, etc. When I get to the log-in screen, it used to show the last DE I logged into as the default option, but now it shows XFCE every time, despite my main DE being Mate. Obviously, all you have to do to change it is pick Mate from the drop down, but I’m curious as to why it suddenly shows XFCE as the default option. Is there a way of manually setting up Mate to show us as the default option at the log-in screen? However, my existing .local folder, is currently over 23 GB. This added to the rest of my /home files amount to a lot more than 20.3 GB. 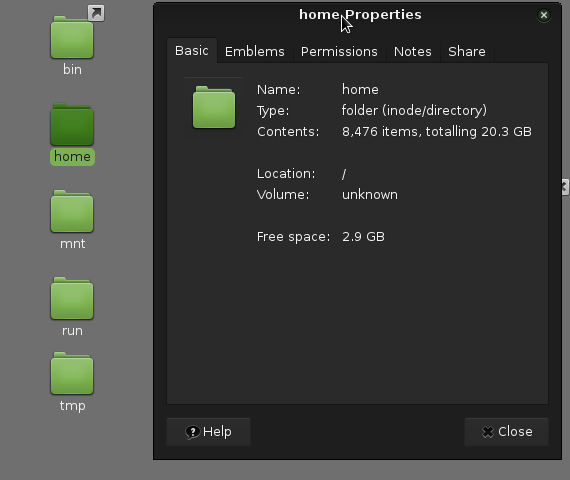 When you right click the /home folder and choose properties, does the used space tally not include hidden files or something? As you can see from the attached .jpg, it says used space 20.3/free space 2.9–yet it’s a 100 GB partition. And even after deleting the 43 GB .local.bak, if I right-click my home folder, it still says I only have 2.9 GB free.